In The Cosmic Serpent Jeremy Narby presents a novel theory that the snakes often in seen in the visions of people taking ayahuasca actually are visualizations of DNA. The proposed mechanism of transmission is biophotons which I discussed more extensively in a previous post. The double helix of DNA resembles two snakes wrapping themselves about each other. The ayahuasca vine itself often wraps itself around itself or around limbs of other trees in a serpent-like fashion. His hypothesis is that ayahuasqueros are seeing DNA-emitted photons in their visions, hence the visions often contain snakes. During these visions Nature is actually communicating with us at a cellular level. While DNA may be involved, there might, however, be a simpler and in many ways more profound explanation. The visions of snakes may be ancestral memories of real snakes. Many tribes of the Amazon that use ayahuasca trace the origin of the world or life to a cosmic snakes or sometimes twin snakes. This sort of belief, however, goes far beyond the Amazon in its prevalence. The Australian aborigines also consider the creation of life was the work of a Rainbow Snake. Worldwide we can find mythological associations of snakes and trees. At the beginning of the Bible we have Eve tempted by the serpent to eat from the Tree of Knowledge of Good and Evil. In Norse mythology, we have the Yggdrasil which is an immense ash tree with various creatures, among them a dragon, living inside it. The Yggdrasil with its branches extending to the heavens and its roots extending to the underworld is believed to be of shamanic origin. Certain occult versions of the Kabbalistic Tree of Life show a snake or serpent winding through it. The Rod of Asclepius, as well as caduceus symbol of the Greek god Hermes which is often confused with it, both have a rod of wood with a snake wrapped around it. In Eastern mysticism and yoga we have the Kundalini symbolized by a snake lying coiled at the base of the spine which is linked symbolically to the Tree of Life or World Tree. Animals with sight first appeared over 500 million years ago during the Cambrian Era. A theory by Andrew Parker of Oxford University is that atmospheric changes in that time brought more light to earth and the benefits of sight for predation produced a rapid evolution of eyes independently in multiple lineages of animals. Predation drove other changes – the development of teeth and jaws and the development of protective coverings and shells. From these lineages with sight that became either predator or prey evolved all of the complex animals in the world today. Humans along with monkeys, lemurs, gorillas and bonobos, are primates. Primates developed from arboreal ancestors in tropical forests about 100 million years ago. They are characterized by relatively large brains, forward looking eyes, adaptations for climbing, many with opposable thumbs that allow grasping, and extensive reliance on vision at the expense of smell. In fact, primates are probably the most visually oriented of all animals. One of earliest theories about primate evolution was that smell wasn’t particularly useful in the trees but vision was, so vision replaced the olfactory sense as the primary method of perceiving the world. Another theory is that primates needed good vision for stalking and grabbing insects which this theory postulates may have been a significant portion of early primate diet. Yet another theory was that vision was needed for spotting small fruits and plucking the fruit which may have been camouflaged among leaves and branches. Evidence for our 100 million year arboreal heritage appears in our nightly dreams. One of the most commonly reported dreams is the dream of falling. Falling would be one of the worse things that could happen to an animal living in a tree. The animal most commonly reported in dreams is a snake. About a third of adults have an irrational fear of snakes. Trees and snakes together again in our nightly dreams. Could it be that our dreams and visions of snakes derive from mechanisms that evolution has provided to protect us from large predator snakes? Lynne A. Isbell developed the hypothesis in 2006 that our primate ancestors evolved good, close-range vision primarily to spot and avoid dangerous snakes. This became known as the Snake Detection Theory. She presents evidence for this in her book The Fruit, the Tree, and the Serpent: Why We See So Well. Her arguments are quite rich and complex and I can only hit the highlights of them here. Primates took to the trees to exploit the abundance of fruit, nuts, flowers, and leaves that began to appear in the evolutionary record at the same time. This required a shift from the olfactory sense to vision. There is a trade-off between vision and the olfactory sense. Mammals can do either one or the other well but not both. Mammals that hunt prey can and do so successfully with reliance on the olfactory sense. Mammals with larger fruit diets tend to have the best vision and larger brains. The glucose from fruit helped to fuel the expansion of the brain which enabled the expansion of the visual system in a feedback loop. The final piece of puzzle comes into play when we understand that, with a reduced olfactory sense, primates would have been extremely vulnerable to predatory snakes. The selective pressure for vision capable of detecting an immobile predator with colors and markings designed to blend with its environment, caused primates to develop their acute visual sense and the association of snakes with structures in the brain relating to attention response and fear. In support of this theory, a recent study by Isbell and others has identified areas of the brain in primates that react more quickly and forcefully to images of snakes. The brain area is part of the thalamus which is located at the top of the brain stem near the center of the brain. The thalamus is particularly involved with processing sensory information and relaying messages between parts of the brain. This pulvinar area is almost non-existent in rats and is a very small size in cats. It is primarily present in primates. In this study, rhesus macaque monkeys were reared in a walled colony and had never seen a snake. When the monkeys were shown various images, they reacted more quickly and strongly to images of snakes than other images. The specific neurons in the pulvinar region of the brain that fire with snake images may have evolved specifically for recognition of snakes. 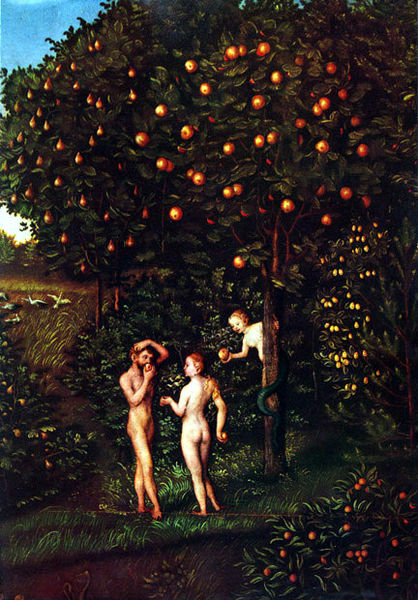 In one neat theory we have tied together the key elements of the Garden of Eden story: tree, fruit, serpent, and knowledge; our arboreal heritage, our early diet, our fear of snakes, and our large brain. An intense cerebral clarity, a sense of unbounded awareness of knowledge and capacity for creativity, a feeling of peace and euphoria. When this happens the inner eye of the mind seems to open for an exploration of the interior little-used space of the cerebral labyrinth. There, entangled among the most elemental roots of the primordial identity in the brain stem, memories from perhaps a million years of evolution seem to await exposure and review. Sensory impressions of such subtlety that they normally go unrecorded begin to register as signals from outside the body fade and cease to dominate the brain. Latent sensory and perceptive capacities suppressed by the conscious mind thus become available, giving access to the vast collective unconscious with its untranslated body memories of both near and distant past. Perhaps on some unknown unconscious level the genetic encoder DNA provides a bridge to biological memories of all living things, an aura of unbounded awareness manifesting itself in the activated mind. Our brain carries in itself its evolutionary history and its record may go back even farther than the 100 million years ago when primates evolved. It may go back even to the beginning of consciousness and life, to the times when we were small creatures floating in vast oceans or worms slithering blindly through earth. Tools, such as meditation and ayahuasca, may grant us direct access to this heritage. Our ordinary consciousness may only be a thin envelope over the deeper layers that comprise our real core being. This entry was posted in Ayahuasca, Brain size, Human Evolution. Bookmark the permalink. I have written a short paper about your snakes you may find of interest; my perspective is a bit different. The paper is titled “Dedicare Omnimodus: A New Ontology of Introspection” but I’m linking you to a paper I submitted to the FQXi essay contest, “Binary Operators in Harmonic Oscillation: An Exploration Beyond Time” (http://www.fqxi.org/data/essay-contest-files/Hansen_Binary_Operators_in.pdf). The Dedicare paper is referenced and the Binary paper contains a small bit of additional information which is rather important. Also, with regards to the Lamb passage, I would direct your attention to the recent psilocybin research of Robin Carhart-Harris et. al. (http://psychedelicfrontier.com/how-psilocybin-works-addition-by-subtraction/). It’s some very interesting research in which they administer the psilocybin intraveneously and then monitor brain activity using fMRI. Challenging accepted theory, they demonstrate that during more extreme hallucinations, the brain actually becomes much less active, like it’s an information filter which becomes inhibited by the psilocybin . . . Interesting papers. Thanks for sharing. If there is a constant selection pressure selecting humans for enculturation skills, then over time the human neurological system would evolve to support those traits. The evolutionary process would pass through a phase of neurosis wherein the neural energy is bound and restrained in an organized way to support primarily sociability (in Freudian terms the ego and superego); however, with continuing selection pressure for intelligence and communication, the need would grow to free up increasing amounts of this neural energy. The end result of this direction could be a human who today we might say is awakened or enlightened.